You don't have to wait until you're in Venice Beach, CA to score a hemp necklace on the boardwalk! Just learn some basic macramé skills here to do it yourself! Once you go through this tutorial, you'll be able to bring your hemp and clipboard to the beach to make them in the sand! 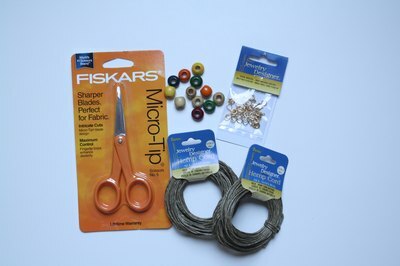 In order to create your hemp necklace, you'll need: hemp (have a good amount on hand for this project, so go with a package with at least 10 yds), a pair of scissors, beads (ones with large enough holes that hemp will fit through), clipboard/tape/mat to secure bracelet to, and some craft glue along with a toothpick to dab. Please see the last slide for an itemized list of tools and materials. You will need two pieces of hemp to create this necklace. For the base strand, measure the hemp by wrapping it around your neck once. Double this amount (and tack on a few extra inches, for safety) and trim the end so you have one piece. For the second piece of hemp, which will be the one being knotted, take your original neck measurement from Step 1 and transfer that number into feet, then subtract two (ie. 17” = 15’ of hemp, 11” = 9’ of hemp, etc.). Cut this amount. Take the shorter, base strand, fold it in half to make a loop, and find the center point. Then take the longer, working strand, fold it in half to make a loop and put them together. Knot both pieces of hemp together right beneath the loop, creating a space of ½” - ¾”. The necklace will be created using square knots – to create this style of knot, start with the right working strand and bring it UNDER the center base strands and to the left and then take the left working strand and bring it OVER the center base strands and to the right. Put the ends of each working strand through the loops that were created on each side, and pull them tight. This is the first half of the square knot. To finish the square knot, reverse Step 7. Take the right working strand and bring it OVER the center base strands and to the left and then take the left working strand and bring it UNDER the center base strands and to the right. This completes a full square knot. For a basic hemp necklace, you can continue this process until you find a length that’s suitable, but to give the necklace an extra bit of flair, beads can be added. For this necklace I added a wooden bead to the two center base strands after making six square knots. After adding the bead, I continued my next pattern of six square knots again. I repeated the process of adding a bead and making six square knots until the necklace’s length was met. To seal off the necklace, I took a wooden bead and tied a knot at the end to secure it in place. This will fit through the original loop made to secure the piece. After the knot was made, I dabbed some craft glue in the center for extra security and then trimmed the excess hemp. Using jewelry clasps and jump rings offer alternative ways to secure the necklace.